Equipped with Bullet Drop Technology, the Barska 6-18x40 AO .17 Hot Magnum Riflescope is well-suited for making high-precision and distant shots, calibrated for your rounds. The optical system features high transmission multi-coated, high-density optics that offer edge-to-edge image clarity. With medium-to-long-range magnification and a 40mm aperture, you will be able to zoom easily on near and far targets in most lighting conditions. 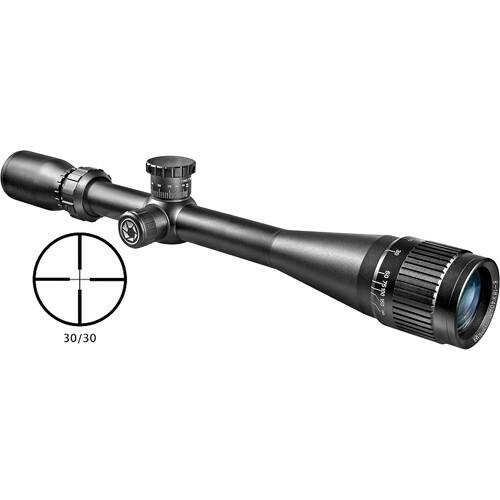 The riflescope also features a 30/30 Reticle with four long heavy posts and a thin crosshair. To correct for parallax error when aiming for precision shots, this optic provides an adjustable objective. For ballistic drop and wind-drift, the capped windage and elevation turrets offer 1/4 MOA impact point correction and a 25 MOA total range. The anodized aluminum housing has a 1" maintube and delivers a waterproof, fogproof, and shock-resistant performance. The Bullet Drop Technology allows you to compensate for bullet drop, calibrated for different round grains using the three included interchangeable .22 BDC elevation knobs for 40GR, 38GR, and 36GR. It also offers pre-calculated trajectory compensation from 100 to 300 yards. All the knobs and rings are heavily knurled for a comfortable and non-slip grip. Also included are a lens cloth and lens caps. Long eye relief of 3.1"
Box Dimensions (LxWxH) 17.1 x 3.2 x 3.0"